E-pistle 2009/28 – Where Does a Specific Taste Come From? Let me start to say that this e-pistle unfortunately not gives you all the answers out there, maybe not even one. But I hope that it will start some activity. Laphroaig has, for me, a very special taste. Of course it’s smoky as the most Islay whiskies but in a different way. What is it that make Laphroaig different and where does that specific taste come from? Well, let me begin with a description of the specific taste that I find in the nose and mouth. To explain a taste can be very difficult to express. Sometimes the right words are hard to find, and it can also be some disagreements between two persons use of the same word. But I’ll give it a try. Here is my explanation of the taste in some words: citrus fruit not lemon but grape and orange, apple but not the red sweet ones more the green apples that have some kind of bitterness. It also has some salty/briny notes. If that is the saltwater, the seaweed or something else salty is hard to say, but let us call it a salty tone. Of course there are more tastes to find, at least a lot of peat smoke and it differs from Laphroaig to Laphroaig. But that citrus and apple bitterness is very rare in other smoky Islay malts. That’s why I think that Laphroaig very often is the easiest one to find in a blind tasting. Are you with me? This, for me, very special Laphroaig taste, isn’t always there, to make it even more complex. Most of the independent bottles haven’t got it. The new Laphroaig bottles also, in some way, have lost some part of this special taste. The new Cask Strength batch 1 is almost ok but the new 18 year old has not much of it. The young Càirdeas bottles also have lost most of this special taste. How come? Different use of their own malted barley, less yeast or use of more refill bourbon casks or combinations of this? The new Laphroaig taste is getting more and more like the other smoky Islay’s. It is a pity, because Laphroaigs unique taste is slowly disappearing. So folks if you like the old Laphroaig taste, its time to buy OB 15 year old, OB Cask strength 55.7% and the other older ones. So when we speak about where to trace this special taste we can jump to maturation. Or can we not do that? Ok, let me explain it if I can. First we have the malted barley. Most of it is made by Port Ellen Maltings. But how does that malted barley differ from Lagavulin and Ardbeg? I am not thinking about the phenols level, because we know that it differs. One question is from where Port Ellen Maltings get their peat. Do they use the same peat for Laphroaig, Lagavulin and Ardbeg, or do they collect the peat from different areas and with different levels of moisture? I have heard that Laphroaigs own peat area has more moss in it than most of the others. But can that explain the special taste? Let us say that Port Ellen Maltings use the same peat for all the distilleries, but Laphroaig self uses their own moss peat for its own maltings. If it is like that, is the only possible way to trace the special taste concerning the peat, Laphroaigs own malted barley (about 20-25% of the total used). What I am trying to say is that Laphroaig uses some parts of their own malted barley in all their OB bottlings. At least I think so. But the whiskies they are selling for blending or to independents just have malted barley from Port Ellen Maltings. This is just a wild guess and not a fact. Most truly Laphroaig uses a mix of the malted barley for all their batches. But in 2003 Laphroaig made 100.000 liters with just their own malted barley. We’ll see in the future what taste that one got. But if this is totally wrong we can forget about the malted barley as a way to trace this special taste. What have we got then? Water of course, but I do not think that it has the answer. Do you remember, back in the old days? It was this bitter dispute over water rights, between Laphroaig and Lagavulin when Lagavulin tried to let the water take another way, for 100 years ago. Unsuccessful with that Lagavulin established a micro-distillery at their site called Malt Mill which attempted, though unsuccessful, to duplicate Laphroaig itself. Water can for sure taste different, but not enough to explain this different taste. So let’s leave the water. Then we got the yeast. The Kildaton distilleries use almost the same yeast (Mauri), but I think that Laphroaig use quite a bit more yeast than the others. Can that be a part of the answer? Yes, maybe a part, but I suppose that isn’t more than just a part. Laphroaig use distillers yeast and to get fruitier tones you need to use brewers yeast. Still, most often the independent bottles and Laphroaigs own bottles differs in taste. Of course the equipment, the use of it and the people who run it can differ from distillery to distillery but that can not be said between the Laphroaig IB and OB bottles. Does Laphroaig make two different single malts in different batches, on for their OB’s and one to sell for blending and to IB’s? Maybe they run small hearts for its own bottles and larger ones for all the others? On thing to be said about the distilling is that Laphroaig has for example a much longer forshot run than Ardbeg, giving Laphroaig a different and maybe fruitier taste. So what is then left? Maturation! But why do IB’s and OB’s differ in taste so often when we speak Laphroaig? The only answer I can find is that Laphroaig don’t sell any whisky to IB’s that got the 1st fill bourbon casks from Makers Mark or the other 1st fill bourbon casks. When we speak about maturation, can the storage place help us? No, I don’t think it can. Laphroaig isn’t unique in that, so the answer is no. Some whisky is matured on site but some elsewhere, as all the other distilleries. Recent articles/studies say that the place of maturation doesn’t matter, just as long as temperature and humidity is at the right levels. Most of Laphroaigs whisky is not matured on Islay. All the whisky that will end up as blends is matured on the mainland. I suppose that we are near the right answer when we say that all the whisky matured on the mainland is matured in refill casks. That whisky is for blends but also for sale to IB’s/brokers. What that whisky then lacks is that special taste. But can just the casks used cover the whole answer? The whisky matured on Islay is for Laphroaigs own bottlings, and it is matured in 1st fill bourbon cask (and some others). But why is the new 18 year old that different? Has Laphroaig started to use refill casks also for their own bottles? What is then left to say? Right now this is a little mystery. There are a lot of questions to be made and answered and maybe someone out there is able to help me solve the mystery. Maybe it has an easy answer or more surely it has not. The main track is for sure the casks, but I think it is a combination of causes. 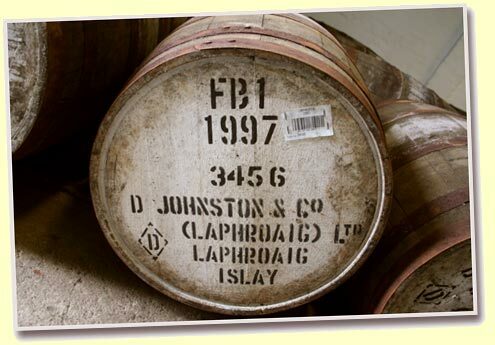 I have emailed John Campbell, Master Distiller at Laphroaig, containing some questions about their peat, malted barley, casks, maturation places and their cask sale to IB’s/brokers. But when this e-pistle had come to printing, I had still not got any answers. If I can solve this taste issue, I just can’t drop it. So I suppose it will be a part two story next spring, but only if the source of the special taste then is elucidated or at least in the right direction.